Posted by Will Thomas in Collins-Evans Q&A. As we conclude our 8-part Q&A with Harry Collins and Rob Evans concerning their Sociology of Expertise and Experience project, I would like to thank them for taking the time to answer the questions and for participating in the blog format. As we continue to toss around and develop ideas on this site, I imagine we will have many opportunities to refer back to this series. Please note that Collins and Evans crafted their responses jointly. Will Thomas: You mentioned back in your foundational paper in SSS (cited here) that the establishment of levels of expertise “has the feel of a classic problem”. I would tend to agree, finding in my own work on operations research that creating social arrangements where “policy science” can contribute to rather than dictate decision making was a central concern in the postwar evolution of the various policy sciences. In reading your work I am reminded of Herb Simon’s work Administrative Behavior, or even Robert Merton’s “The Role of Applied Social Science in the Formation of Policy: A Research Memorandum” Philosophy of Science 16 (1949) 161-181. Have you been finding over the last several years that SEE has had resonance in other fields? Thanks to Jenny (and John!) for holding down the fort while I was away at HSS. I attended some really interesting sessions, and will share some general-interest highlights presently. Today, though, we present our penultimate entry in our Q&A series with sociologists Harry Collins and Rob Evans about their “Wave 3” Sociology of Expertise and Experience program. Take note that Collins and Evans crafted their response jointly. Will Thomas: What is the role of the public/private divide when assessing the uses of expertise, i.e. does the periodic table of expertises function differently in public versus in private? Returning to themes from questions 2 and 3, would you agree that the sociology of science literature has more of a focus on issues of public authority as opposed to private decision? We continue our 8-part Q&A with Harry Collins and Rob Evans concerning their Sociology of Expertise and Experience project. Once again, we note that Collins and Evans crafted their answers jointly. This is not a spontaneous exchange. Will Thomas: You begin the introduction to your book with the statement: “Science, if it can deliver truth, cannot deliver it at the speed of politics.” The statement implies certain things about the nature of politics and the nature of science, particularly that politics seeks action where science seeks certainty (i.e. “truth”). Yet, as Jasanoff has pointed out (say, in her “EPA” piece in the 1992 Osiris), it is politics that demands certainty of science, not science itself. Science, absent a political imperative, tends to be used for the production of more science, rather than the production of solid claims. Does science have a tolerance for uncertainty that politics does not? Can science make legitimate decisions quickly if certainty may be discarded? Does politics demand certainty (or at least the appearance of it) when taking action? If not, what constitutes the requirements of a legitimate political decision? 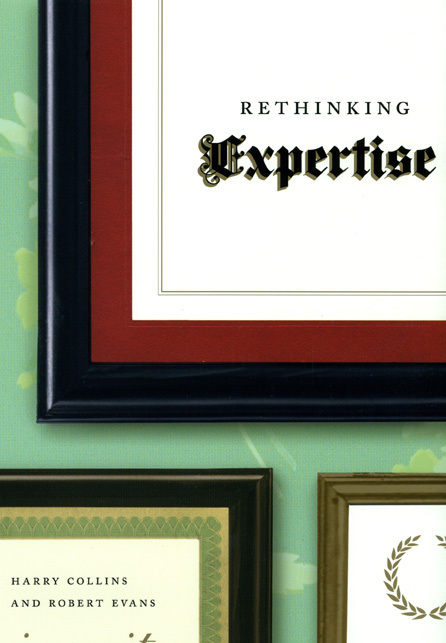 Will Thomas: The problem of expertise in policymaking has long been a concern to scholars such as Sheila Jasanoff (The Fifth Branch, Science at the Bar, etc.) and Yaron Ezrahi (Descent of Icarus [out of print]), and, more recently, for Bruno Latour (The Politics of Nature). Drawing on the insights of SSK, they have argued that scientific experts cannot be called on to offer non-politicized policy recommendations, because scientific consensus-building is itself a political process. Instead (to paint with a broad brush), effective policymaking can only take place when facts and political concerns are negotiated simultaneously. Pretending otherwise only opens the door to the systematic sowing of doubt concerning the validity of even a large-majority consensus (as we can see on classic issues such as global warming, the cigarette-cancer link, and evolution in science education). I notice you don’t engage with this literature directly. Is this a fair reading of the literature, and do you see yourselves as extending it, addressing difficulties presented by it, or answering different questions entirely? Rob Evans and Harry Collins: To repeat, Wave 2 of Science Studies shows (and Collins has made a considerable contribution to showing it) that it is impossible to have a pure science free of the influence of ‘extra-scientific factors’ including politics. To that extent all technological decisions in the public domain must be influenced by politics whether we notice it or not. Where Wave 3 departs from the previous work is in what are taken to be the implications of these discoveries. The predominant mode of thinking coming out of Wave 2 is that, because scientific and technological decisions are a continuation of politics, the ideas of a scientific/technological decision on the one hand, and a political decision on the other, cannot be separated. It follows that Wave 2 treats the very notion of the scientific and the political as constructed. Posted by Will Thomas in 20th-Century-Science Historiography, Collins-Evans Q&A. 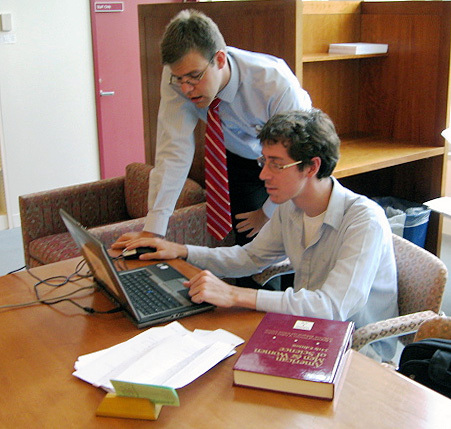 Will (L) and Christopher pretending to work on their web project for the benefit of the AIP's weekly newsletter. One of my ongoing concerns is the problem of writing a coherent history of 20th-century science and technology. As I’ve been working on assembling names for my web project on notable post-1945 American physicists (on which Christopher is assisting me), I’ve been trolling through the National Academy of Sciences’ database of deceased members. Living members are helpfully grouped by section, and we’ve simply taken members of the “physics” and “applied physical sciences” sections. Deceased members, on the other hand, are not so grouped, so I have to look everyone up and sort out the physicists from the psychologists, anthropologists, chemists, geneticists, and so forth. Predictably, this has resulted in some problematic category issues. What to do with physical chemists, electrical engineers (especially those who won Nobel Prizes in physics)? ; what separates an astronomer from an astrophysicist? when is mathematics physics-y enough to include mathematicians? Will Thomas: Is there a fact/value divide within this theory to distinguish those who participate purely as stakeholders, and those who participate as experts? Whose responsibility is it to reinterpret the claims of non-expert stakeholders within the expert framework? What are the implications of SEE for the democratic ideal? Rob Evans and Harry Collins: There is a clear distinction between experts and stakeholders and between propositions and preferences. The language of facts and values, however, cross-cuts the distinctions we want to make. Starting with stakeholders, in the Third Wave paper we disentangle the concepts with Wynne’s sheep farmer example. The sheep farmers were both experts and stakeholders in the matter of farming practice post-Chernobyl. Those who owned the farms (let us imagine they were London based financiers), were stakeholders only. The sheep farmers had a legitimate contribution to make to the technical phase of the debate (i.e. how to measure the contamination of the sheep) in virtue of their expertise in sheep farming and Lakeland ecology. The owners of the farms did not have this expertise and so could not, and should not, contribute to this debate. Nevertheless, both sheep farmers and farm owners had legitimate contributions to make to the political phase of the debate in virtue of their stakes in the matter. Will Thomas: Your book’s epigraph is from Ecclesiastes: “To everything there is a season… a time to break down, and a time to build up.” One of the key strategies of prior sociology of science has been to question the socially constructed science/non-science divide in establishing what knowledge can be considered authoritative. Through the construction of a “periodic table of expertises” you attempt to establish new normative standards of policy participation relating to whether actors have “contributory” or “interactional” expertise, and so forth. Who determines who has primary access to a given problem and, thus, what other parties have pertinent expertise? Is this purely a matter of social and political power, or are there other means of assembling teams of relevant experts? Will Thomas: Your main concern in moving in the direction of SEE relates to a long-standing concern with the authority that knowledge bestows, and particularly Wave Two’s concern with dismantling the notion that scientific knowledge possesses an authority inherent to itself. Would you say that the problem of authority has been the central motivation behind the sociology of science? Is the unlimited extension of expertise to “folk knowledge” “folk wisdom” , which you criticize, a logical consequence of the Wave Two approach? Rob Evans and Harry Collins: Chacun a son gout. We can’t speak for others, but for us the problem has never been one of authority. Instead, what is at the centre are the questions posed by the philosophy and the sociology of knowledge: How do we have knowledge and is there any way of making it secure? Understanding how science works is essential for understanding these more fundamental questions. It is true that the motivations of some of those who came into science studies was more directly connected with ideas of socially responsible science—the Society for Social Studies of Science’s most prestigious award is named after J.D. Bernal after all—but for us any changes to the idea of science have emerged as a consequence of the uncovering of the social nature of knowledge not the other way round. Ether Wave Propaganda is pleased to present as a special serialized feature this Q&A session with Cardiff sociologists Harry Collins and Rob Evans regarding their Sociology of Expertise and Experience (SEE) program. As a special feature, it will not adhere to the usual length restrictions we try to keep on posts, and, therefore, will run unusually long. Also note that this post does not represent a spontaneous exchange. Collins and Evans have asked for clarifications on the original questions, and have carefully crafted joint responses. They have also asked me to ask them to modify their responses if I deemed them inadequate or wrong, so as to make the Q&A as useful as possible. I saw no need to do so for the first question. Will Thomas: SEE is an attempt to move beyond the sociology of knowledge into a sociology of expertise, and is explicitly formulated as a “third wave” in the sociology of science. What is it that most distinguishes SEE from other attempts to move beyond the initial insights of SSK, such as the Actor-Network Theory, or Pickering’s “mangle”? As I’ve suggested in my posts on Simon Schaffer’s early works, sociology, whether we acknowledge it or not, is an essential component of historiographical work. The sociology of scientific knowledge (SSK) program, initiated in the 1970s, has led to some remarkable improvements in historiographical method, essentially by requiring historical explanation for things that were previously taken for granted because knowledge produced by scientific method was assumed to speak for itself. Where prior scholarship might have simply assumed that good scientific work diffuses on its own (and those who didn’t see that it was “good” were just intellectually deficient), suddenly educational background, the efforts of scientists to “sell” their ideas, resonance with scientists’ religious or intellecutal convictions mattered in understanding the history of science (what I call the “Reception Revolution”). Similarly, it became inadequate to claim that those who were simply “more curious” or who “looked harder” at nature saw new things; the ability to see new things (at least in all but the most obvious cases) required some understanding of what projects those scientists were undertaking, what training prepared their minds to see what they saw. And, most famously, the policing of the borders of scientific communities became of paramount historical interest, because conclusions could only be legitimately validated by those in an appropriate moral and intellectual position (Shapin and Schaffer’s famous “Hobbes was right”). SSK was a boon to the history of science because it caused historians to ask new questions, and, lo and behold, we found good answers to the questions that we asked.